Welcome to the official site of IGI Company! IGI Company is the official dealer of Robert Bosch, VARTA, and the distributor of OSRAM. Our company is one of the biggest sellers of automobile spare parts of German companies such as BOSCH, OSRAM and VARTA in Russia. Our clients have a great opportunity to get spare parts for automobile at the price of manufacturers. In business we since 1992. For this time we became the largest partner of German concern BOSCH. For today we offer more than 10 thousand of BOSCH auto parts in our warehouse in Moscow and more than 100 thousand various autospare parts in Germany. Since 1998 we offer wide range of autolamps of OSRAM company, who is one of the largest lamp manufacturers in the world. Also our company works with the leading VARTA company in production of automotive batteries. 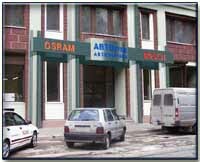 Our company covers the large part of Russian autospare parts market. We offer a wide range of automotive parts: from high-quality wiper blades to professional ignition components. If our clients couldn't find any autospare part at our Moscow warehouse, then there is a possibility to order it from Germany within a week. You can reach us by folowing directions. In order to help our clients with quick search and purchasing of automotive parts our company introduced "automobile spare parts internet shop".